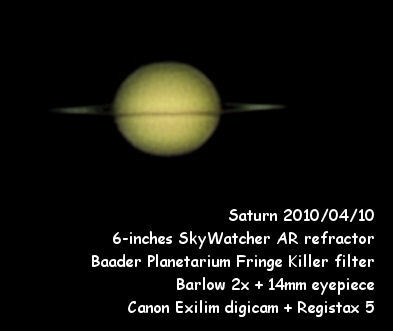 This image of Saturn has been obtained after processing a 4 minutes video took with a Casio Exilim digicam. In order to avoid refractor chromatic aberration a Fringe Killer filter was used in combination with a 14mm eyepiece and a Barlow lens. Hommel is a big crater with nice craterlets inside, a Clavius-style set, but smaller, measuring 76 miles (129 Km). It is located in the South-East area of the visible Moon face. This area is pledge of small craters. It is similar in appearance to the sand of a beach. Pitiscus, Nearch and Asclepi are some of its neighbors. The picture was taken at 19 days of lunation, that is 4 days after full Moon. This is the best timing to get sharp images of the crater’s walls’ shadows. The image is an integration of 27 subframes, each one taken at 9 Megapixels single shots with point-and-shoot digicam Casio Exilim EX-FS10. I have been lucky tonight. Good seeing to see Jupiter. Using a small binoculars between the eyepiece and my eye I could spot visually Jupiter in high definition at an effective 450x magnification. That’s pretty good for a 150/600 reflector, isn’t it? As you may appreciate in the following picture, the GRS (Great Red Spot) is clearly visible near the center of the planet. Several details are visible in the Jupiter’s bands. The image was obtained with a non-tracking Newtonian 6-inch telescope, a 14mm eyepiece, a Casio Exilim EX-FS10 digital camera that recorded 165 subframes. Registax 5 dealt with the alignment and stacking process. Dyadic Wavelets were applied to get contrast and details. PSP9 did the post-processing. The footage was taken exactly at 2009-07-28 03:33 UT. Here several post-processing results are shown. The first one is that I like more. Here it is, Jupiter, Europa & Ganymede. Galilean moons are very easy to observe using some kind of instrument to get some magnification. With just a binoculars would be enough to spot the four moons of Jupiter. They are constantly rotating around Jupiter. Every day their relative distances and positions changes. Their names are Io, Callisto, Europa & Ganymede. They all have a similar size and brightness. When passing in front of the big planet, they cast a shadow over the gaseous surface of Jupiter. It is required a telescope to observe such events. Here it is a picture I took tonight with a digital pocket camera through a 14mm eyepiece and a 150 mm newtonian reflector telescope with no-tracking system.